Run for your life! Have you ever stood outside, and a bee comes along, and flies around you, or tries to land on you, and won't go away? I've had that happen in the summer when I was wearing a certain cologne from Avon, and it smelled just like roses. I've been stung a few times, but never by a bumblebee or wasp, just honey bees. I've never been chased by a swarm either, knock on wood! I'd like to hear your story of any relationship you've had with a bee, ant, wasp or anything else that bites. I've been bitten by ants and a horsefly and I don't know which is worse! If your experience was a terrible one, then I apologize for bringing it back to mind! The bee stamps are from Judith, and they are two separate "Stubbies", one large, one small. Since stamping them normally would have had them flying in the opposite direction, I had to figure out how to flip the images. I used a black marker, and colored only the bee's body without the wings, and stamped the image upside down. I had to hand-draw the wings on. If I had stamped them normally, the bee's would have been flying upside down in order to chase the "girls". That's something I would like to see more of in stamps - the ability to order a stamp's mirror image, unless you have an idea or suggestion on how we can do it easily without a separate stamp. I'd love to hear your suggestions on this! 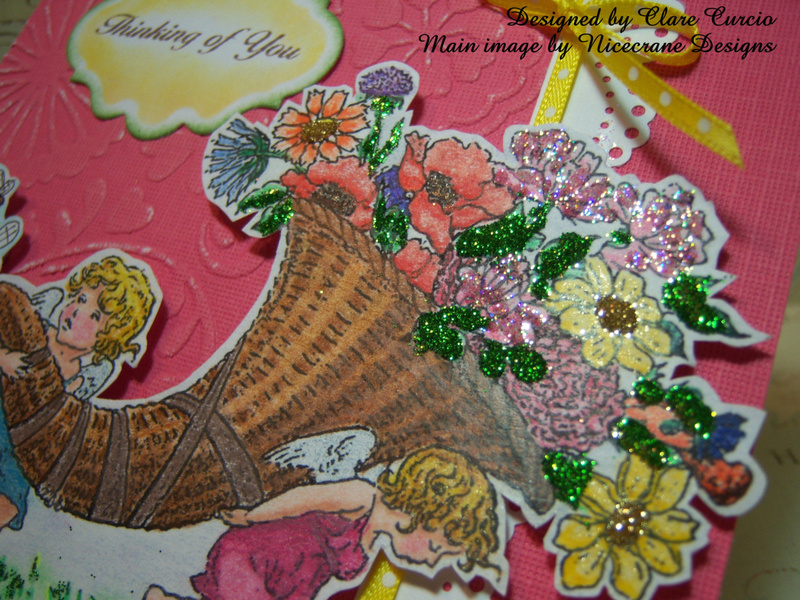 The background cardstock was embossed using my Cuttlebug and a Cuttlebug embossing folder called Floral Fantasy. I used a sanding block to take some of the top layer of the cs off to show the white core. Cardstock is from a DCWV stack. The sentiment stamp is from the Justrite set 'With Sympathy', and the border punch is Martha Stewart's. 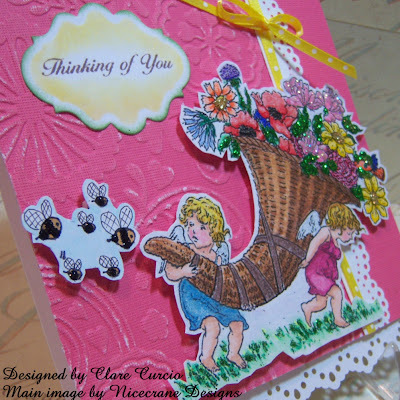 The sentiment was cut out using a Spellbinders Labels Twenty die, and colored in with a sponge dauber and SU's Daffodil Delight classic inkpad. The white cs is from SU. Thank you for visiting, and I love to hear from you, so please leave a little note! 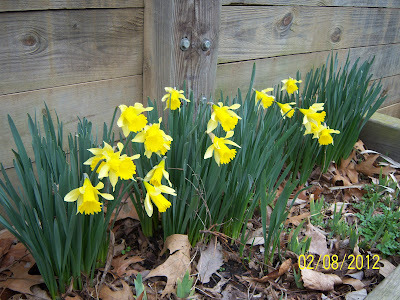 Before you leave, I wanted to share with you a photo of my backyard flower box! Way too early, but beautiful! The first one actually bloomed on January 29! We have had such a mild winter - no snow and mild temperatures! Wanted to thank you dearly for your visit today to my blog. It brought tears to my eyes to read your post. I also have struggled with depression and know how hard it can be. I feel so bad that you have had so many family members effected. I will add you to my prayers and will pray that your daughter realizes she can ask for help. I spent years working at a private psychiatrist office and have dealt with so many and know how hard it can be. I am your newest follower and hope to hear good news in the near future. Oh I am loving your new music!!!! 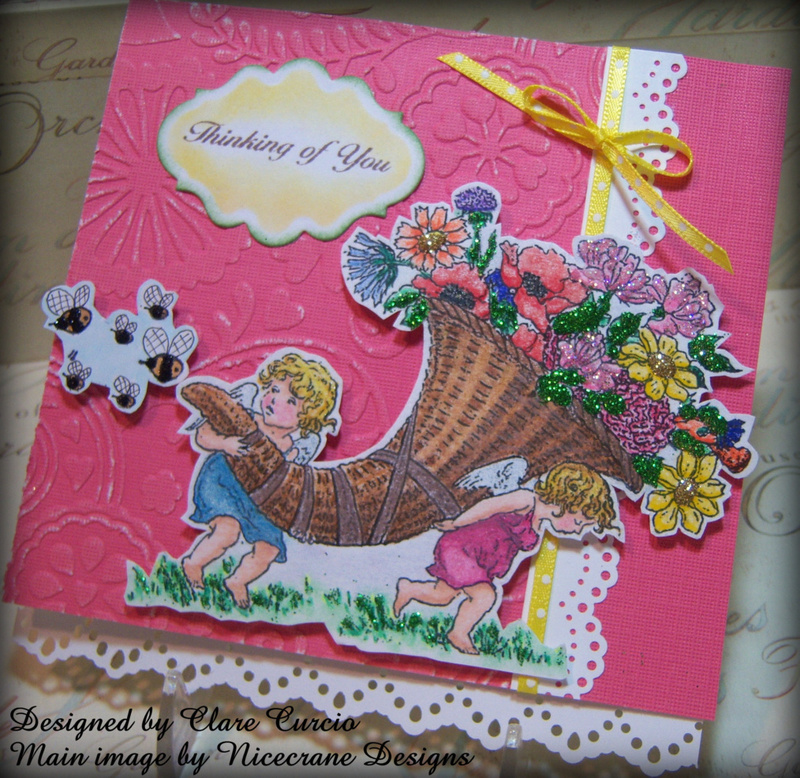 Love your card... it's so fun and YOU are so clever!!! I don't think I would have ever thought of stamping just the bodies upside down and then drawing in the wings!!! I agree.. we need mirror reverse options for stamps! There is a way you can stamp the image on plain rubber and then stamp that rubber on paper quickly before it dries. I've tried it but don't get a good crisp image. I either need practice, or it's a technique that leaves a little to be desired! I love your fun image and all the glitter! I have been stung by most every kind of bee we have here... they seem to love me! I also get bit by spiders every time I work in the yard. Unfortunately I swell up like crazy when I do get bit. A spider bite will easily get 5+ inches in diameter! Strange! LOL! Anyway.... it's WAY too cold today for bees, so I guess that's a good thing!